Bob Brown was named President & CEO of Catholic Charities Community Services in January of 2010. He joined the organization in January of 2008 as its chief administrative officer. Brown has worked for a diverse range of companies, from small start ups to Wall Street giants such as Dun and Bradstreet and Xerox. He has vast experience across industries and business functions, including marketing, general management, finance and information technology. But, after more than 25 years of successfully strengthening companies in the for-profit world, Brown felt a calling-he wanted to give back, to use the skills he had gained in the business world to help people. Brown has a bachelor's degree in accounting from St. Bonaventure University and a Master's of Business Administration from the State University of New York at Buffalo. 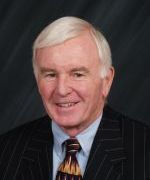 He is a member of the Business Advisory Council for the School of Business at St. Bonaventure University, a member of the Health Record Banking Alliance Regional Board of Directors, and a Board Member at the Franciscan Renewal Center. Brown shares his Paradise Valley home with his wife of 46 years, Nancy. They enjoy visiting their six grown children and 15 grandchildren.